Free agents Hanley Ramirez and Pablo Sandoval have agreed to deals with the Red Sox, a major league source confirmed to the Globe Monday. Ken Rosenthal of FoxSports.com reported that Ramirez, a shortstop, will arrive in Boston Monday to finalize a five-year, $90 million deal. On Monday morning, CBS Sports’s Jon Heyman reported that Sandoval’s five-year deal was worth nearly $100 million. Both deals are pending physicals. One of the two could be finalized Monday. Ramirez, 30, a former Red Sox farmhand, was not going to be re-signed by the Los Angeles Dodgers, who felt he was a defensive liability. But Ramirez is a lifetime .300 hitter, who batted .283 with 13 homers and 71 RBIs in 128 games last season. For Sandoval, 28, Boston will be a change after seven seasons with San Francisco. The switch-hitting third baseman known as the “Kung Fu Panda” was a favorite at AT&T Park as thousands of Giants fans wore panda-themed hats and T-shirts to games. One group of four friends donned giant black-and-white panda heads when Sandoval came to the plate. Sandoval delivered for his public, too. He is a career .294 hitter with an .811 OPS and 106 home runs. He has been even better in the postseason, hitting .344 in 39 games and driving in 20 runs. Sandoval appeared in only one World Series games in 2010 but was a significant contributor to the San Francisco championships in 2012 and ’14. There’s a chance that Ramirez could play left field and the Red Sox could deal Yoenis Cespedes for pitching. Cespedes would be a good fit for the Seattle Mariners, who are looking for a righthanded power bat and could make righthander Hisashi Iwakuma available, or the Philadelphia Phillies, who have lefthander Cole Hamels to deal and could use offense. The Phillies have long been eyeing Boston’s top young talent, with an interest in infielder/outfielder Mookie Betts, shortstop Xander Bogaerts, and catcher Blake Swihart, and they also like Boston’s young pitching. Cespedes also would make sense for other teams with pitchers to trade, such as the Cincinnati Reds (Johnny Cueto) and San Diego Padres (Tyson Ross). If the Red Sox don’t trade Cespedes, it would appear that the additions of Ramirez and Sandoval leave no room for Betts, outfielder Allen Craig, or outfielder Shane Victorino. Ramirez, who was dealt to Marlins in the Josh Beckett/Mike Lowell deal in 2006, has said he is willing to play any position, though he has never played the outfield in the majors. Ramirez has had a good offensive career since leaving Boston. He was the National League Rookie of the Year with the Marlins in 2006 and won the NL batting title in 2009, when he hit .342. He has averaged 25 homers and 87 RBIs in his career. He was traded to the Dodgers in July 2012. The Red Sox were aggressive in their pursuit of Sandoval, who said after the World Series that he hoped to stay with the Giants. The Padres were also involved and, to a lesser degree, the Toronto Blue Jays. Sandoval started a three-day visit to Boston Nov. 17 that included a meeting with David Ortiz before he sat down with team officials. The Sox made it clear that they saw Sandoval as an important component in their lineup. Because Sandoval was extended a qualifying offer, the Red Sox will lose their highest unprotected draft pick. That will come in the second round. Free agency was well-timed for Sandoval. The Giants were eager to retain him after their postseason run and the Red Sox saw him as their best solution to fill their hole at third base. Age is a plus for him. At 28, he is still in the prime of his career. A $100 million contract may seem high for a two-time All-Star who has yet to drive in 100 runs. But Sandoval has consistently been an above-average hitter with a knack for putting balls in play. Sandoval also brings some much-needed lefthanded power to the Sox. He is a career .304 hitter from the left side, including .317 last season. His righthanded hitting has declined in the last few seasons, but the Red Sox lineup will help offset that. There are risks. Sandoval weighs in the vicinity of 250 pounds and the Giants were often frustrated with his failed attempts to get in better shape. But Sandoval plays an adept third base even at his size and is not a detriment on the bases. As he ages, Sandoval could shift to DH for the post-Ortiz Red Sox. While his production is unlikely to match that of Ortiz, Sandoval would represent at least an acceptable option. These signings leave two other Red Sox players in an uncomfortable position. 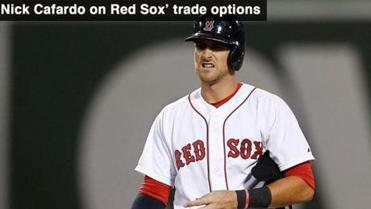 Will Middlebrooks, the Opening Day third baseman the last two seasons, faces a return to Triple A or a trade. After a strong rookie season in 2012, he has hit .213 with a .265 on-base percentage since and had three stints on the disabled list. At 26, Middlebrooks may need a fresh start with another team. Garin Cecchini, 23, has some experience in the outfield but has been primarily a third baseman since he was drafted in 2010. He has ranked high on prospect lists, but last season he had a modest .712 OPS in 114 games for Triple A Pawtucket. Cecchini could return to the minors to learn a different position, perhaps left field. He also could be a trade chip. Meanwhile, the Red Sox are still very much involved in trying to bring lefthanded starter Jon Lester back to Boston. Lester is still meeting with teams and will go back for another round of talks to seek final offers. The Sox’ first offer was in the $110 million-$120 million range for six years, but it appears they would go higher. By adding two players, the Red Sox will have to take two off the 40-man roster. Candidates would be Jemile Weeks, Ryan Lavarnway, and Dan Butler. The Sox built their last World Series champion by signing a large group of free agents to short-term, manageable contracts. Now, after finishing in last place, these additions represent an adjustment in philosophy. Nick Cafardo can be reached at cafardo@globe.com. Follow him on Twitter @nickcafardo. Peter Abraham can be reached at pabraham@globe.com. Follow him on Twitter @peteabe.